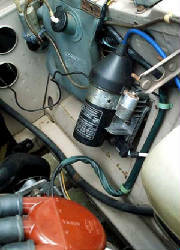 As I write elsewhere in the site, I remain a big fan of converting vintage Fiats to electronic ignition from the standard points style, mainly for reliability benefits and arguably hotter spark. So it is with my ’74 124 Coupe in which I run the later Marelli stock and it is very reliable. Performance increase? Hard to say, probably some. But not having to mess with points and starting at a flick of the key is performance increase enough for me. This ignition was stock on the '79 and later injected cars. I know many other people who are running it on their earlier carbed DOHC motors and I think this conversion is more common than the use of the after-market Crane ignition. They are fairly inexpensive, readily available from a number of sources including eBay. The simple swap out of the coil and dizzy can take less than 10 minutes. Unlike with the Crane ignition, it doesn't require gutting or any cobbled re-use of your points dizzy should you ever want to switch back. 1) The distrubutor has a vacuum advance. Leave this disconnected as carbed cars have no "ported" fitting to properly run this feature. Simply set your timing at idle to 12°-18° BTDC and it will work like a charm. 2) Some early cars will exhibit tachometer bounce with the Marelli electronic ignition. That is: the tachometer will bounce around, generally act flaky, and pretty much be useless. Marelli specifies the use of 0.68uf capacitor in-line on the tach wire to correct the problem. To read more about this go to my Tach Fix Page. 3) Before installation of a used electronic distributor, its a very good idea to replace the magnetic pick-up as a matter of course. 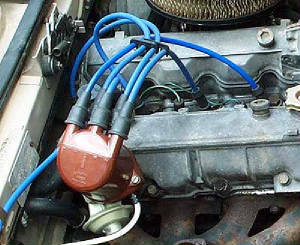 Whether it being from the dizzy living near the heat of the exhaust manifold or just plain & simple old age, the external control wire gets stiff and brittle, but more, the two inner wires are known to fray and pull apart. Keeping the magnetic pick-up fresh (replace every two years or so) will ensure the very reliable service these units provide.